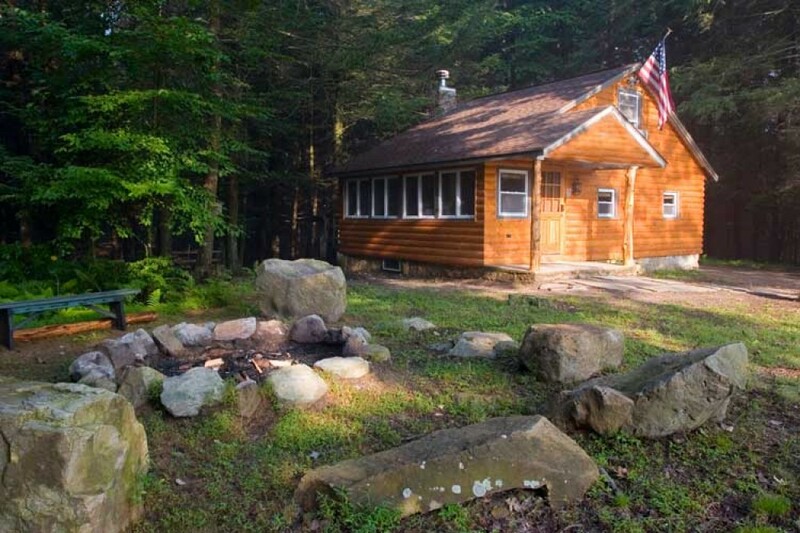 As owner of Pocono Vacation Rental – secluded log cabin we take all credit that our cabin is one of the most sought after Vacation Rentals in Pennsylvania. We, with the help of professional designers, designed and decorated the cabin to look elegant and give pleasure to our guests. The whole renovation carried out in 3 years and now we have the results. Waterfalls, walking trails, hemlock forest, thunder sound of rolling stream, etc, are some of the most spectacular natural sights we offer at first hand. Just seeing these surroundings you will be bemused definitely. When you drive your vehicle towards your vacation resort, you will feel that you are in a park, State Park. Mountains, fields, turkeys, trees, streams and deer are always ready to welcome you and greet you. This marvelous cabin at Kunkletown Vacation Rental is also surrounded by log sliding. In the inside of this Rough Cut Pine can be seen. The porch is built from hemlock tree trunks and is considered to be very strong. Furthermore, on both the sides’ fieldstone lie endlessly. Sitting on a huge stone besides to a campfire is a nice experience to cherish. The cabin has 1 bedroom, 1 bathroom, a long balcony and a full kitchen. You can test your culinary talent as there are no brand restaurants near to our condo. Further, high speed wireless internet will be a great option to get to know the current happenings of the world and be in touch with your friends. Staying inside the condo you can visualize the wildlife and surrounding trees from the windows. The condo is very strong and has been built with robust trees of 1940s. Enjoy the view of turkeys along with their babies every day. Deer feeding corn place allures deer to come and have something. That makes you see them and get entertained. At night the surrounding areas become very fascinating and exciting by the spotlight put on and off frequently. The spotlight makes natural habitat exciting as well.